MicroRNAs (miRNAs) are small noncoding RNAs (ncRNAs) involved in several biological processes and diseases. MiRNAs regulate gene expression at the posttranscriptional level, mostly downregulating their targets by binding specific regions of transcripts through imperfect sequence complementarity. 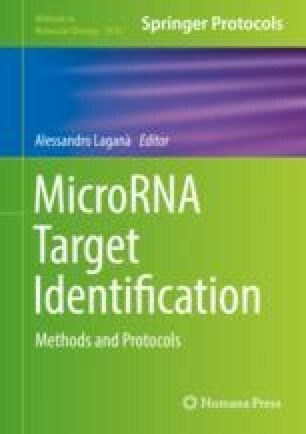 Prediction of miRNA-binding sites is challenging, and target prediction algorithms are usually based on sequence complementarity. In the last years, it has been shown that by adding miRNA and protein coding gene expression, we are able to build tissue-, cell line-, or disease-specific networks improving our understanding of complex biological scenarios. In this chapter, we present an application of a recently published software named SWIM, that allows to identify key genes in a network of interactions by defining appropriate “roles” of genes according to their local/global positioning in the overall network. Furthermore, we show how the SWIM software can be used to build miRNA–disease networks, by applying the approach to tumor data obtained from The Cancer Genome Atlas (TCGA). G.F., F.C., and P.P. have been supported by SysBioNet, Italian Roadmap Research Infrastructures 2012. FR has been supported by the Novo Nordisk Foundation (grant agreement NNF14CC0001). MP would like to acknowledge funds from the Flagship project InterOmics (PB.P05, CUP B91J12000270001) funded by the Italian Ministry of Education and University (MIUR) and National Research Council (CNR) organizations, project RepeatALS funded by Arisla (Italian Society for Research on Amyotrophic Lateral Sclerosis), the PRIN 201534HNXC project funded by the Italian MIUR, and the joint CNR IIT-IFC Laboratory of Integrative Systems Medicine (LISM). The results reported in this chapter are in part based upon data generated by the TCGA Research Network: http://cancergenome.nih.gov/.